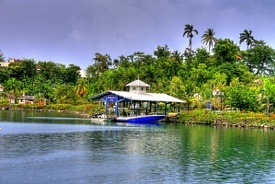 Port Antonio is located on Jamaica's secluded northeast coast. This quiet town offers pristine beaches, beautiful mountaintops, cascading waterfalls and peaceful lagoons. Scuba diving, surfing, snorkeling, and deep-sea fishing are some of the popular activities. Guests may also explore the waterside promenade, go horseback riding in the mountains, or raft down the Rio Grande.